It's often said in sports that the only thing tougher than winning a championship is successfully defending the crown the next year. Players want more money, there's free agency, and every opponent gets up to play you. In the new millennium, no hockey team in the world has defied the odds against championship repeats better than Finnish club Kärpät Oulu. The club has won the Canada Bowl (the trophy awarded to the Finnish champion) in three of the last four seasons, and this season is the odds-on favorite to make it four championships in five years. Kärpät finished first in the SM-Liiga with 121 points, six ahead of the second-place Espoo Blues. The Oulu club has finished in the top spot in the regular season for four straight years. This time around, though, the sailing wasn't always so smooth. Kärpät got off to a so-so start by its standards, trailing Pelicans Lahti through the first month of the season. Then, talented but troubled former NHL defenseman Jere Karalahti made international headlines for all the wrong reasons. In early November, Karalahti was arrested on a series of drug-related charges, including smuggling and distribution. He was taken off the ice by police during a Kärpät practice session, and subsequently was suspended by the league and released by the team. Losing Karalahti after 15 games created a significant hole on the Oulu blueline, but veteran offensive defenseman Jukka-Pekka Laamanen helped cushion the blow by going on a tear in December. In eight games that month, he posted eight points (three goals, five assists), and a plus-6 rating to take SM-Liiga Player of the Month honors. For the season, the small but agile backliner had 10 goals, 30 points and a plus-26 rating while playing an average 22:17 per game. Fellow defenseman Ilkka Mikkola -- a key player throughout Kärpät's run of championships -- also elevated his play. The 29-year-old Mikkola, a 1997 Montreal Canadiens draft pick, led the league's defensemen with a plus-31 rating, and contributed 27 points. Former Nashville Predators defenseman Mikko Lehtonen (a longtime Kärpät player who returned to Finland after a one-season sojourn in North America) has emerged as Kärpät's top offensive producer on the blue line. The 30-year-old led all defensemen on the club with eight goals and 33 points. He closed the season strong, with nine points in the club's final eight regular-season games. Janne Pesonen, a 25-year-old winger who was chosen by the Anaheim Ducks in the ninth round (No. 269) of the 2004 NHL Entry Draft after winning SM-Liiga Rookie of the Year, has emerged as the most prolific offensive talent in the league. Pesonen stands a good chance of winning the Lasse Oksanen Trophy as league MVP. Pesonen led the SM-Liiga with 34 goals, 78 points and a plus-39 rating in 56 games. Pesonen had a strong season last season, scoring 22 goals and 55 points in the regular season and adding four goals and seven points in nine playoff games. He's taken his game to a higher level this season. A model of consistency, Pesonen has gone back-to-back games without a point just three times this season, and has not had a single three-game drought. Meanwhile, he's registered at least one point in 47 of the 56 matches Kärpät has played. Beyond Pesonen, Kärpät enjoyed a deep, balanced scoring attack this season. Hannes Hyvönen (24 goals, 66 points) finished third in the league in scoring, while Michal Bros (23 goals, 53 points) finished in the top-10. Nine Kärpät players reached double-digit goals this season. Going into last year, Kärpät management had to plug a huge hole in net. Longtime Oulu starting goaltender Niklas Backstrom left Kärpät to join the Minnesota Wild after winning two Jari Kurri Trophies (the Finnish equivalent of the Conn Smythe Trophy) and a pair of Urpo Ylönen Trophies (the Finnish version of the Vezina Trophy). The club hoped former New York Islanders and Pittsburgh Penguins prospect Andy Chiodo could hold down the fort when they signed him in 2006, but it didn't work out. Instead, Tuomas Tarkki has emerged as one of the most pleasant surprises in the SM-Liiga. 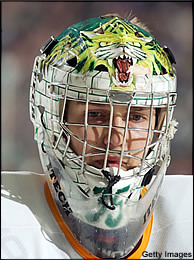 A former Northern Michigan University and Chicago Wolves goaltender who attended training camp with the Atlanta Thrashers in 2005-06, Kärpät signed Tarkki to a two-month trial contract at the start of the 2006-07 season. Kärpät Oulu goaltender Tuomas Tarkki led the Finnish league with a .932 save percentage, ranking second in GAA. 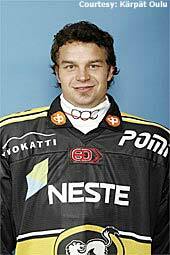 All he did was end up backstopping Kärpät to first place and the Finnish championship. In the 2007 playoffs, Tarkki dazzled with a miniscule 1.26 goals-against and a sparkling .958 save percentage. This season, there would be no sneaking up on opponents. Tarkki turned in a rock-solid encore during the regular season, as his .932 save percentage led the league, and his 2.01 GAA ranked second to Philadelphia Flyers draft pick Bernd Brückler. Tarkki also posted a pair of shutouts. Under the SM-Liiga's current playoff format, six teams earn automatic spots in the quarterfinals. This season, Kärpät, Espoo, Jokerit, Tappara, JYP and the Pelicans finished in the top six. Those clubs now await the winners of mini-playoff series between the teams that finished between seventh and 10th. For Kärpät, that means waiting for lowest-seeded team remaining after seventh-place HIFK and 10th-place TPS Turku battle it out in one series and Ilves Tampere and Lukko Rauma face off in the other series. A year ago, Kärpät Oulu made history by sweeping through the playoffs with a perfect record of 10-0, downing Jokerit in the finals after dispatching the Pelicans in the quarterfinals and Espoo in the semis.